Wheel-made Grey Ware of the Early Iron Age (EIA) in Macedonia is a pottery category well-known to archaeologists working in the region. Other scholars may not be very be familiar with it, as it has never been treated in an exhaustive study exclusively devoted to this topic. Now, stratified finds from recent excavations enable a reassessment of the old problem concerning the derivation of this pottery category. While the class might have been first noted by Hubert Schmidt (Schmidt 1905, 101), it was defined for the first time by Stanley Casson, a British archaeologist who during World War I had worked in areas of Central Macedonia held by the Entente troops (Gardner and Casson 1918–19, 31; Casson 1919–21, 24). His excavations in the Early Iron Age necropolis of Chauchitsa 1 brought to light several examples of the type fossil of this Macedonian pottery class: a one-handled carinated cup with a high-swung handle (cf. Fig. 1 from Kastanás). Central Macedonian wheel-made Grey Ware is a fine-ware class of pottery and is characterised by its grey break and grey surface. The surface is usually burnished with some kind of hard tool, traces of which are often visible. In spite of this, in many cases wheel-marks can still be seen on the surface. Sometimes the surface finishing is even more meticulous, i.e. polishing carried out with a soft cloth or the like. The surface may be shiny in its visual appearance. One of the rarer fabrics at Kastanás shows a monochrome decoration with grey paint 2. Developed examples of the class are further characterised by frequent grooves that run parallel to the rim and are organized in groups or cover the whole field of the upper and/or lower part of the vessel (Fig. 1, from Kastanás, Level 5). Fig. 1. Grey Ware carinated cup (type 3) from Kastanás, Level 5 (after Hänsel 1982b, 199 fig. 18.6). As the map shows (Fig. 2), this Grey Ware class is typically found in the region of the Thermaic Gulf and in the Central Macedonian river valleys of the Axios and Gallikos. There it appears in tell settlements (toúmba = tell in Macedonia, Fig. 3) as well as in the cemeteries of various kind. The northernmost site in this region is the settlement of Vardarski Rid near modern Gevgelija, just north of the Vardar gorge. Grey Ware seems to be non-existent farther to the north in the middle Vardar Valley of northern Macedonia. In the west it is securely attested at the Dailáki cemetery on the hills southwest of Lake Kastoriá (Tsougaris 1999, 22). This location seems quite remote on the map (Fig. 2), but the ware must have been far more densely distributed. The gaps on the distribution map between the lower Aliakmon River and Lake Kastoriá can in all probability be ascribed to gaps in research or the lack of publications on excavated material. Likewise, no examples are published from the Mount Olympus region, but Grey Ware is attested north of the Pieria Mountains with several vessels at the tumulus cemetery of Vergína and with a single vessel in the North Cemetery of Pydna. 1. Agrosykiá, cemetery (Αγροσυκιά, Αμπέλια): A. Chrysostomou 1994, 130 and personal communication by Anastasia Chrysostomou, for which I am very grateful. 2. Arhontikó, cemetery (Αρχοντικό): A. Chrysostomou and P. Chrysostomou 2003, 480, 487 fig. 2.2. 3. Áspros, settlement (Άσπρος): French 1967, 5–6, 57 (no. A 19) and personal examination by Stefanos Jimatzidis. 4. Ássiros, toúmba (Άσσηρος Τούμπα): Wardle 1980, 260 with fig. 19.54; idem 1997, 449. 5. Axiochóri, toumba (Αξιοχώρι): Heurtley and Hutchinson 1925–26, 27 fig. 14.4, 28, pl. 20a.1 (type 3); Heurtley 1939, 107, 216 fig. 87g, 232 no. 471, pl. 21.471. 6. Chauchitsa, cemetery (Τσαουζίτσα, Τσαυσίτσα): Gardner and Casson 1918–19, 31 pls. 3.4, 6, 5.1; Casson 1919–21, 24, 25 fig. 20, 26 fig. 21a; Casson 1926, 148, 151 fig. 57,left; Heurtley 1939, 235 no. 484, pl. 21.484. 7. Double Table of Anchíalos (Διπλή Τράπεζα της Αγχιάλου): Sakellariou 1967, 421, pl. 471δ; Tiverios and Gimatzidis 2004, 223–4, 231 fig. 2. 8. Góna, table (Γκόνα): Skarlatidou and Konstantinidou 2005, 221. 9. Kastanás, toúmba (Καστανάς): Hänsel 1982a, 287 with fig. 14; idem 1982b, 197; 199 fig. 18.6; Jung 2002, 198–214 pls. 65–8, 99, 108. 10. Kastoriá, Dailáki, cemetery (Καστοριά, Νταηλάκη): Tsougaris 1999, 22. 11. Konstandía, cemetery (Κωνσταντία): A. Chrysostomou 1998, 160 with n. 12. 12. Kouphália A, settlement (Κουφάλια Α): French 1967, 16, 60 (no. A 15) and personal examination by Stefanos Jimatzidis. 13. Limnótopos, toúmba (Λιμνότοπος): Heurtley, Hutchinson and Buchanan 1925, 24, 25 fig. 6.4–5, pl. 13.1–7, 15–18, 21. 14. Néa Philadélphia, cemetery (Νέα Φιλαδέλφεια): Misaïlidou-Despotidou 2000, 264–5, 268 fig. 9.2. 15. Palatianó, settlement (Παλατιανό): Anagnostopoulou-Chatzipolychroni 2003, 154, 160 fig. 24. 16. Palió Gynaikókastro, cemetery (Παλιό Γυναικόκαστρο): Savvopoulou 2001, 176–7 with fig. 19; cf. also Savvopoulou 1988, 307, 310 fig. 8. 17. Perivoláki, toúmba (Περιβολάκι): Heurtley and Ralegh Radford 1932, 135–7 fig. 25a; Heurtley 1939, 237 no. 494, pl. 21.494. 18. Phákos, settlement (Φάκος): French 1967, 28–9, 64 (no. Y 1) and personal examination by Stefanos Jimatzidis. 19. Pydna, North Cemetery (Πύδνα): Karliambas, Besios and Triantafyllou 2004, 344. 20. Thessaloníki, Néa Efkarpía, cemetery (Θεσσαλονίκη, Νέα Ευκαρπία): Lambrothanassi-Korantzi, Papagianni and Poloukidou 2004, 250, 255 fig. 6.left. 21. Thessaloníki, Stavroúpoli, cemetery (Θεσσαλονίκη, Σταυρούπολη): Lioutas and Gioura 1999, 323, 326 fig. 8.4. 22. Toúmba Thessaloníkis (Τούμπα Θεσσαλονίκης): from the tell settlement (toúmba) see Andreou, Kotsakis and Chourmouziadis 1990, 390; Krachtopoulou and Touloumis 1993, 292 (from phase 3 onwards); from the table (trápeza) and its cemetery see Soueref 2001, 183, 185, 189 fig. 17,upper right, 190 fig. 25. 23. Valtochóri, settlement (Βαλτοχώρι): French 1967, 38, 68 (no. A 16) and personal examination by Stefanos Jimatzidis. 24. Vardarski Rid, settlement (Вардарски Рид): Papazovska 2005, 117, 118 fig. 3,upper right; 139–40 no. 48, pl. 6.49 (by printing error instead of 48). 25. Vergína, cemetery (Βεργίνα): Andronikos 1969, 85 no. 16, 88 no. 35, 106 no. ΑΓ 16, 107–8 no. 37, 191–3 with fig. E 16, 211 with fig. 50, 216 pls. 36 E 16, 40 Z 35, 63 ΑΓ 16, 65 ΑΓ 37; Rhomiopoulou and Kilian-Dirlmeier 1989, 97, 112 fig. 23.1, 140 no. 21. Walter A. Heurtley already observed that Iron Age Grey Ware was not in use on the Chalkidiki peninsula (Heurtley 1939, 106 – with reference to the high-handled cup type), and this judgment has been confirmed by more recent research. The latest excavations at the Toúmba of Áyios Mámas (Prehistoric Olynthus), near the coast between the peninsulas of Kassandra and Sithonia, brought to light quite a number of Protogeometric (PG) painted vessel fragments, but only one sherd that might be classed as wheel-made Grey Ware 3. Grey Ware is absent in the EIA cemetery of Koúkos near Sikiá on the eastern side of the Sithonia peninsula 4. In Toróni cemetery near the southern tip of the Sithonia there is a so-called black-slip ware, which “falls under the rather more ubiquitous category of ‘gray ware’” (Papadopoulos 2005, 483), but has nothing to do with the Central Macedonian class, neither in terms of fabric nor in terms of type repertory (cf. ibidem, 1210–1212 pls. 397–399). To the east Grey Ware has been found at tell settlements in the Langadas basin (Fig. 2), but it does not seem to have been in regular use east of the Strymon River in eastern Macedonia. However, Chaïdo Koukouli-Chrysanthaki draws our attention to a handmade high-handled cup with a grooved cylindrical upper part above a bulging lower part. It was found at Amphipolis and closely resembles the developed Grey wheel-made shape known from Central Macedonia 5. Thus, some pots may have reached the mouth of the Strymon. Wheel-made Grey Ware is present in the cemeteries of Kastrí on the island of Thasos (Koukouli-Chrysanthaki 1992, 568–71), but in all probability this is not related to the Central Macedonian Grey Ware (ibidem 569 n. 711). Its vessel repertory clearly sets it apart from the central Macedonian one. Aside from a Mycenaean-type deep bowl, the Thasian Grey Ware is only represented by closed shapes. The high-handled cup, the type fossil for Central Macedonia, is missing. Some examples of wheel-made Grey Ware are published from EIA tomb contexts in Thessaly 6, but at present it is neither possible to state, whether or not these Thessalian vessels are related to Central Macedonian pottery, nor whether this Grey Ware reflects a continuity in production from the Late Bronze onwards (see below for Dimíni). As the wheel-made Grey Ware is a new Iron Age pottery class that is not rooted in Bronze Age potter’s craft, it provoked theories on its origin and derivation right after its first discovery. Any derivation of the Grey Ware still depends upon our ability to detect external influence on the regional pottery workshops of Central Macedonia at the end of the Bronze Age, as there is no continuity of wheel-made Grey Ware production in Macedonia from the Middle Bronze Age onwards (Horejs 2007; eadem in press). Besides that, Heurtley (1939, 107) already correctly observed that Grey Minyan pottery was never in use in the Axios Valley, where the production centres of the Iron Age Grey Ware must be localised. Casson expressed the opinion, that the Central Macedonian Grey Ware had “certainly some connection with Hellenic pottery as well as with Danubian fabrics” and “appears to combine a Northern with a Southern element” (Casson 1919–21, 27). Heurtley likewise thought of a northern origin of the characteristic high-handled cup and related it to metal vessels of the “Lausitz people” (Heurtley 1939, 107). He tried to connect it with immigration from the north, for which he thought to find evidence in another new pottery class appearing at the beginning of the Early Iron Age. This is a kind of handmade pottery with channelled or fluted decoration, which was interpreted by Heurtley as pottery of the Lausitz-type deriving from central Europe (ibidem, 98–9, 103–4, 124–5). Although there are some quite good arguments for the existence of some immigrants from farther north, who reached the lower Axios Valley during the 12th century BCE (Hänsel 2002) 7, such migratory processes cannot explain the production start of wheel-thrown Grey Ware. This is due to the fact that wheel-made pottery was nearly unknown north of the lower Axios Valley. Late Bronze Age wheel-made pottery of Mycenaean type is attested only in single exceptional cases in northern Macedonia (Videski 2007, 212 pl. 54e), and any kind of wheel-made pottery of the 2nd millennium is totally unknown from the upper Vardar Valley, the Morava Valley and farther to the north. The central European metal vessels evoked by Heurtley as parallels for the typical Grey Ware cups cannot be called morphological parallels at all (Jung 2002, 209). Manolis Andronikos subscribed to Heurtley’s theory regarding possible metal prototypes for the high-handled carinated cups and extended this interpretation also to a bulging high-handled juglet with grooved neck from Vergína. In contrast to Heurtley, he did not cite any metal vessels in support of his hypothesis (Andronikos 1969, 217). When he wrote his opus in the 1930s, Heurtley of course was knowledgeable of some of the Grey Ware of the northeast Aegean (he cites the younger, Iron Age varieties), and he noted the similarities in fabric between that class and the Macedonian one; however, he forbore suggesting a direct connection to the northeast Aegean “in view of the particular area to which it [the Central Macedonian Grey Ware cup] is confined, i.e. the Axiós Valley and the Lankadás basin” (Heurtley 1939, 107 with n. 2). This is a strong argument, indeed. At this point it is necessary to take a look on the stratigraphic data available today. The earliest Grey Ware from Kastanás in the Axios Valley has received its final publication (Jung 2002), while chronologically more recent material found at this toúmba will be published by Stefanos Gimatzidis (see his contribution on this web-site). At Kastanás the class most probably made its first appearance in Level 13 dating to LH IIIC Developed–Advanced (Fig. 4) 8 and is well attested in the following long-lived Level 12, which spans the phases from LH IIIC Advanced/Late until EPG (Fig. 8). At Toúmba Thessaloníkis it was first in use during Phase 3 (Andreou, Kotsakis and Chourmouziadis 1990, 390; Krachtopoulou and Touloumis 1993, 292), which can be paralleled with part of Level 13 and the beginning of Level 12 at Kastanás 9. At Ássiros Toúmba Grey Ware is only reported from Phase 1 of the later Early Iron Age. Accordingly, these finds represent a developed stage of Grey Ware types 10 known from architectural phases at Kastanás, which are much younger than Level 12. At the toúmba of Axiochóri (former Vardaroftsa) to the north of Kastanás in the Axiós Valley, the earliest attestation of wheel-made Grey Ware was found in the upper part of the so-called burned layer 11. It is very problematic to date this upper part of the “burned layer” in terms of relative chronology, but it might be contemporaneous with part of the period of use in Kastanás Level 12 (Jung 2002, 230–1). Fig. 4. Grey Ware carinated cup (FT 240 or type 1 of Grey Ware carinated cups) from Kastanás, Level |13 (after Jung 2002, pl. 65.530). Fig. 8. Grey Ware carinated cup (FT 240 or type 1 of Grey Ware carinated cups) from Kastanás, Level (11)–12 (after Jung 2002, pl. 66.538). It thus follows that the production and use of Grey Ware most probably started around LH IIIC Advanced or Late on the coasts of the Thermaic Gulf and in its broader region. It is important to analyse the repertory of vessel shapes and the fabric in order to find an answer to the question, concerning the region from which the inspiration for Central Macedonian Grey Ware manufacture may have originated. In the earliest Levels of its use at Kastanás (Levels 12–11, but probably already Level 13) Grey Ware made up only c. 3% of the whole assemblage produced on the potter’s wheel (Jung 2002, 211). More than half of the Grey Ware rim sherds (Fig. 5) from these Levels can be assigned to the Mycenaean deep bowl shape FT 284/285 (Fig. 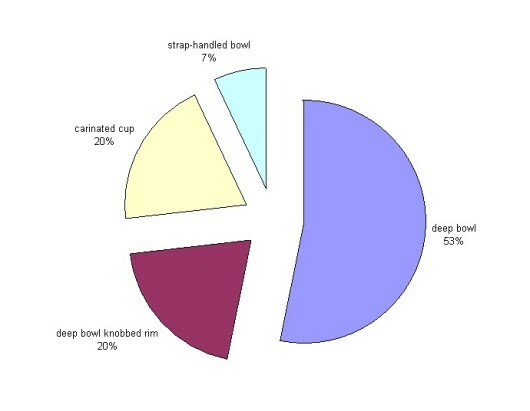 9, 10), 20% belong to a special variation of deep bowls with a knobbed rim (Fig. 11, 12), 20% are carinated cups of the Mycenaean shape FT 240 (Fig. 4, 8), and 7% fall into the category of Mycenaean strap-handled bowls FT 295 (one example, Fig. 13). It is immediately obvious, that the earliest Grey Ware from the toúmba of Kastanás comprises table ware, which is predominantly Mycenaean in type. Fig. 5. Frequency of Grey Ware vessel types at Kastanás, Levels 13–11 (rim fragments). Fig. 9. Grey Ware deep bowl (FT 284/285) from Kastanás, Level 12 (after Jung 2002, pl. 65.532). Fig. 10. Grey Ware deep bowl (FT 284/285) from Kastanás, Level 11 (after Jung 2002, pl. 67.542). Fig. 11. Grey Ware deep bowl with knobbed rim from Kastanás, Level (11)–12 (after Jung 2002, pl. 65.536). Fig. 12. Grey Ware deep bowl with knobbed rim from Kastanás, Level 11 (after Jung 2002, pl. 67.543). Fig. 13. Grey Ware strap-handled bowl (FT 295) from Kastanás, Level (11)–12 and 11 (after Jung 2002, pl. 66.537). Solely the deep bowl with a knobbed rim has no exact Mycenaean counterpart, because it shows a very slight carination below the rim which sets the widening body apart from the out-turned rim. This carination may be stressed by a groove (Fig. 11, 12). A Trojan connection was brought into the discussion about this type, as Blegen-shape A 72 (cf. Pavúk 2002, 59 fig. 16.56, 61 with n. 204) seemed to offer the only possible parallel. However, the carination on the Trojan shape is regularly more marked and often situated above a slight shoulder (Jung 2002, 200), which at Kastanás can be observed only on carinated cups (Fig. 8). Therefore, another explanation should be sought in light of the fact, that no other Trojan influence can be proven to exist in the pottery of Levels 14b–12 from Kastanás 12. The key to the answer seems to lie in the gradual introduction of grooved decoration in the Central Macedonian Grey Ware class during its development in the Early Iron Age. The typological development of the carinated cups is especially instructive. This Grey-Ware shape starts most probably in Level 13 with an example reproducing closely the size and profile of the smaller variety of its painted Mycenaean counterpart FT 240 13. Also the pieces from the following Levels 12 and 11 with their more rounded lower part (Fig. 8, cf. the unpainted and painted Mycenaean pieces Figs. 6, 7) find good parallels among the southern Greek painted cups 14. This type of Grey Ware carinated cup is named type 1 (Jung 2002, 201) 15. It is only in the later EIA Levels, that the upper part of the carinated cup is higher and conical and occasionally decorated with grooves. Without grooves the higher cup is defined as type 2, with grooves as type 3 (Fig. 1) 16. These morphological changes are described in greater detail by St. Gimatzidis on this web-site. In these later EIA phases not only high carinated cups, but also many other Grey Ware shapes are decorated with grooves: juglets (Andronikos 1969, 192 fig. 38,E16, pl. 36.16), kantharoi (ibidem, pl. 65.37), cut-away-neck jugs (Rhomiopoulou and Kilian-Dirlmeier 1989, 112 fig. 23.1; Papazovska 2005, 155, pl. 6.49) and deep bowls (Misaïlidou-Despotidou 2000, 268 fig. 9.1). The latter vessel, a deep bowl from Néa Philadélphia, is definitely wheel-made, but it belongs to a dark fabric 17. Its lip is thickened and the bulging body shows a series of grooves, the uppermost of which marks the beginning of the straight, slightly funnel-shaped upper part. This vessel seems to be a later development of the deep bowls with knobbed rim from Levels 12–11 at Kastanás. Fig. 6. Unpainted carinated cup (FT 240) from Kastanás, Level 12 (after Jung 2002, pl. 63.523). Fig. 7. Painted carinated cup (FT 240) from Kastanás, Level 12 (after Jung 2002, pl. 29.312). Grooved decoration is common to many Grey Wares of different periods and seems to express the idea of unpainted, wheel-made pottery, in the production of which much care was taken to make the vessel surface attractive. Wheel grooves, a by-product of the manufacturing process, were incorporated into the design of the vessel, and some grooves were widened or incised on purpose with a tool, in order to give the vessel a tectonic decoration. In Central Macedonia the earliest Grey Ware vessels do not have such purposeful grooves. Grooves made their appearance in Level 11 in a shallow manifestation (Fig. 11 from a mixed context of Levels 11 and 12 is the earliest) 18. Thus, this kind of decoration may well have evolved around the Thermaic Gulf in the course of an indigenous development in local potters’ workshops 19. If the northeast Aegean is to be excluded as a source of inspiration for the Central Macedonian Grey Ware deep bowl with thickened rim, no other potential Trojan characteristics can be detected in the earliest Central Macedonian Grey Ware pottery. To give just one very obvious example: the characteristic incised wavy lines of the Grey Ware from northwestern Asia Minor are not attested at all on Central Macedonian Grey Ware. Apart from typological arguments, there are also differences in the fabrics between the Grey Wares of Central Macedonia and northwestern Asia Minor (Jung 2002, 212–3). Furthermore, the distribution map shows that Grey Ware technology was not adopted on the coasts of the Chalkidiki peninsula lying closer to Troia than those of the Thermaic Gulf. The only geographical region, in which wheel-made Grey Ware was in use and which at the same time had regular contacts with Central Macedonia, were the Mycenaean areas of the central and southern Aegean. Mycenaean contacts with Central Macedonia let to the adoption of different cultural traits by the population settled around the Thermaic Gulf, as is well known (cf. recently Andreou 2003; Jung 2003; idem 2004; idem 2005; idem, in press; Horejs 2007). In Tiryns, in the Argolid, wheel-made Grey Ware is mainly found in the building horizons dating to the periods of LH IIIB and IIIC. Technologically it is better made than the Central Macedonian Grey fabrics 20. The repertory (Belardelli 1999) is broadly comparable to that in Kastanás, but it is more manifold (cf. Jung 2002, 213). Deep bowls FT 284/285 constitute the most frequent shape like at Kastanás (Fig. 14), but various cup and bowl types are also represented. Closed shapes are attested, while they are absent among the early Grey Ware in Kastanás. The new finds of Grey Ware from the LH IIIC Early re-occupation of the Mycenaean settlement at Dimíni in southern Thessaly are of special importance. They have been dealt with in several publications in the meantime 21. The fabric is very fine and has a nicely burnished surface (Adrymi-Sismani 2006a, 90) 22. Thus, it is of better quality than the Central Macedonian one, but its basic characteristics are comparable. The most frequent shape is the carinated cup – in a larger and a smaller version (Fig. 15); other shapes include the strap-handled bowl FT 295 and a type of belly-handled amphora (Adrymi-Sismani 2006a, 90–1, 106 figs. 6–7; eadem 2006b, 28–30, 35 fig. 21). Apart from the strap-handled bowl these shapes show influence from the southern Italian Grey Ware production, while these Italian characteristics are blended with Mycenaean elements (Jung 2006, 48–50). The smaller carinated cups of Dimíni can be broadly compared with those from Kastanás (cf. Figs. 4, 15). The same applies to the strap-handled bowl. Fig. 14. Grey Ware deep bowl (FT 284/285) from Tiryns, Lower Citadel (after Kilian 1988, 131 fig. 26.18). Fig. 15. 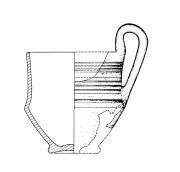 Grey Ware carinated cup from Dimíni, reoccupation of Megaron A (after Adrymi-Sismani 2006b, 35 fig. 21,BE 35738). At both sites, at Tiryns and Dimíni, wheel-made Grey Ware was a special class of pottery, accounting for not more than 2–3 % of all fine ware (at Dimíni, see Adrymi-Sismani 2006a, 90) or even much less (at Tiryns, see Belardelli 1999, 455). However, it must have fulfilled a special function in those Late Mycenaean settlements, because its repertory was not radically different from the contemporary Mycenaean fine-ware spectrum. Such a specific function might explain why it was accepted and imitated even in other regions such as Central Macedonia, where again it was used alongside other wheel-made pottery classes and adapted to the local needs by type selection and morphological modification of the adopted types over time. Further research is necessary to clarify how much the productions of Grey Ware in the Argolid, southern Thessaly and Central Macedonia overlapped chronologically. At Tiryns the latest pieces are dated to LH IIIC Advanced (Kilian 1988, 147–8), which would allow for a technology transfer to Central Macedonia. 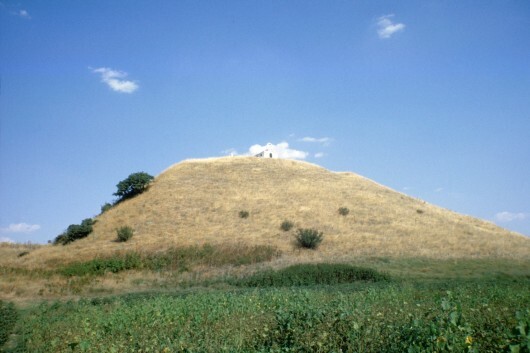 Today no stratified deposits are published from Dimíni, which would prove that the settlement was inhabited after LH IIIC Early 23. Yet this does not exclude the possibility that Grey Ware remained in use at other sites of the Pagasitic Gulf, which may have maintained contacts with the Central Macedonian coasts 24. Adrymi-Sismani, V. 2006a. “Η γκρίζα ψευδομινύεια και η στιλβωμένη χειροποίητη κεραμική από τον μυκηναϊκό οικισμό Διμηνίου.” In Αρχαιολογικό Έργο Θεσσαλίας και Στερεάς Ελλάδας 1. Πρακτικά επιστημονικής συνάντησης, Βόλος 27.2–2.3.2003, 85–110. Volos. Adrymi-Sismani, V. 2006b. “Le palais de Iolkos et sa destruction.” BCH 128–128, 2004–2005 (2006):1–54. Anagnostopoulou-Chatzipolychroni, I. 2003: “Παλατιανό Ν. Κιλκίς. Η πρώιμη κατοίκηση.” AEMT 15, 2001 (2003):149–160. Andreou, St. 2003. “Η μυκηναϊκή κεραμική κι οι κοινωνίες της κεντρικής Μακεδονίας κατά την Ύστερη εποχή του Χαλκού” In Β' Διεθνές Διεπιστημονικό Συμπόσιο «Η Περιφέρεια του Μυκηναϊκού Κόσμου», Λαμία 1999 / 2nd International Interdisciplinary Colloquium "The Periphery of the Mycenaean World", Lamia 1999. Πρακτικά / Proceedings, edited by N. Kyparissi-Apostolika and M. Papakonstantinou, 191–210. Athens. Andreou, St., and R. Jung, in preparation. “The Synchronisation of the Late Bronze Age Levels of the Macedonian Tell Sites of Salonica Toumba and Kastanas” In LH IIIC Chronology and Synchronisms III: LH IIIC Late and the Transition to the Early Iron Age. Proceedings of the International Workshop Held at the Austrian Academy of Sciences at Vienna, February 23rd and 24th, 2007. Andreou, St., Kotsakis, K., and G. Chourmouziadis. 1990. “Ανασκαφή στην Τούμπα της Θεσσαλονίκης 1989.” Egnatia 2:381–404. Andronikos, M. 1969. Βεργίνα Ι. Το νεκροταφείο των τύμβων. Βιβλιοθήκη της εν Αθήναις Αρχαιολογικής Εταιρείας 62. Athens. Apostolopoulou-Kakavoyanni, O. 1992. “Ευρήματα της πρωτογεωμετρικής και γεωμετρικής περιόδου από τις Φέρες.” In Διεθνές Συνέδριο για την Αρχαία Θεσσαλία στη Μνήμη του Δημήτρη Ρ. Θεοχάρη. Πρακτικά, 312–320. Δημοσιεύματα του Αρχαιολογικού Δελτίου 48. Athens. Belardelli, C. 1999. “Produzioni artigianali tardoelladiche dall’Italia meridionale in Argolide: la ceramica pseudominia di Tirinto.” In Επί πόντον πλαζόμενοι. Simposio italiano di Studi Egei dedicato a Luigi Bernabò Brea e Giovanni Pugliese Carratelli, edited by V. La Rosa, D. Palermo and L. Vagnetti, 451–460. Rome. Casson, St. 1919–21: “Excavations in Macedonia.” BSA 24:1–33. Casson, St. 1926. Macedonia, Thrace and Illyria. Their Relation to Greece from the Earliest Times down to the Time of Philip Son of Amyntas. Oxford. Catling, R.W.V., and I.S. Lemos. 1990. Lefkandi II. The Protogeometric Building at Toumba. Part I. The Pottery. Oxford. Chrysostomou, A. 1998. “Το νεκροταφείο των τύμβων εποχής σιδήρου στην Κωνσταντία Αλμωπίας νομού Πέλλας.” AEMT 9, 1995 (1998):155–166. Chrysostomou, A., and P. Chrysostomou 2003. “Ανασκαφή στη δυτική νεκρόπολη του Αρχοντικού Πέλλας κατά το 2001.” AEMT 15, 2001 (2003):477–488. Dakoronia, F. 1994. “Sperchios Valley and the Adjacent Area in Late Bronze Age and Early Iron Age.” In Θεσσαλία – Δεκαπέντε χρόνια αρχαιολογικής έρευνας, 1975–1990. Αποτελέσματα και προοπτικές. Πρακτικά διεθνούς συνεδρίου, Λυών, 17–22 Απριλίου 1990 / La Thessalie. Quinze années de recherche archéologiques, 1975–1990. Bilans et perspectives. Actes du colloque international, Lyon, 17–22 avril 1990, vol A. 233–242. Athens. Desborough, V.R.d’A. 1980. “The Dark Age Pottery (SM–SPG III) from Settlement and Cemeteries.” In Lefkandi I. The Iron Age. The Settlement – the Cemeteries, edited by M.R. Popham, L.H. Sackett and P.G. Themelis, 281–354. Oxford. French, D. 1967. Index of Prehistoric Sites in Central Macedonia. Catalogue of the Pottery in the University of Thessaloniki from Prehistoric Sites in Central Macedonia. Manuscript, private print. Gardner, E.A., and St. Casson 1918–19. “Macedonia § 2. – Antiquities found in the British Zone, 1915–1919.” BSA 23:10–43. Hänsel, B. 1982a. “Siedlungskontinuität im spätbronzezeitlichen und früheisenzeitlichen Nordgriechenland.” In Thracia Praehistorica. Semaines philippopolitaines de l’histoire et de la culture thrace. Suppl. Pulpudeva 3, 270–287. Sofia. Hänsel, B. 1982b. “Ergebnisse der Grabungen bei Kastanas in Zentralmakedonien.” JRGZM 26, 1979 (1982):167–202. Hänsel, B. 2002. “Zusammenfassende Bemerkungen zum Siedlungsverlauf in Kastanas – Kontinuität und Bevölkerungswandel.” In Jung 2002, 11–27. Heurtley, W.A. 1939. Prehistoric Macedonia. 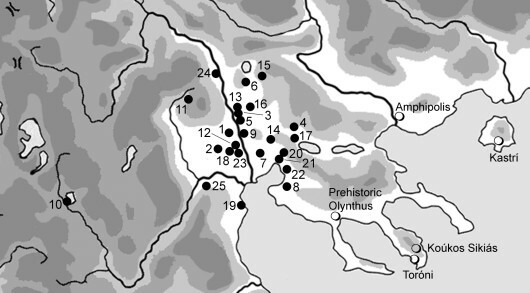 An Archaeological Reconnaissance of Greek Macedonia (West of the Struma) in the Neolithic, Bronze, and Early Iron Ages. Cambridge. Heurtley, W.A., and R.W. Hutchinson 1925–26: “Report on Excavations at the Toumba and Tables of Vardaróftsa, Macedonia, 1925, 1926. BSA 27:1–66. Heurtley, W.A., Hutchinson, R.W., and W.B.C. Buchanan. 1925. “Report on an Excavation at the Toumba of Vardino, Macedonia.” AnnLiv 12:15–36. Heurtley, W.A., and C.A. Ralegh Radford 1932. “Report on Excavations at the Toumba of Saratsé, Macedonia, 1929.” BSA 30, 1928–29, 1929–30 (1932) 113–150. Horejs, B. in press. Die spätbronzezeitliche handgemachte Keramik der Schichten 13 bis 1. In Das Prähistorische Olynth III. Ausgrabungen in der Toumba Agios Mamas 1994-1996, edited by B. Händel. Prähistorische Archäologie in Südosteuropa 22. Jung, R. 2002. Kastanas. Ausgrabungen in einem Siedlungshügel der Bronze- und Eisenzeit Makedoniens 1975–1979. Die Drehscheibenkeramik der Schichten 19 bis 11. Prähistorische Archäologie in Südosteuropa. Kiel. Jung, R. 2003. “Η μυκηναϊκή κεραμική της Μακεδονίας και η σημασία της” In Β' Διεθνές Διεπιστημονικό Συμπόσιο «Η Περιφέρεια του Μυκηναϊκού Κόσμου», Λαμία 1999 / 2nd International Interdisciplinary Colloquium "The Periphery of the Mycenaean World", Lamia 1999. Πρακτικά / Proceedings, edited by N. Kyparissi-Apostolika and M. Papakonstantinou, 211–225. Athens. Jung, R. 2004. “Η χρήση της μυκηναϊκής και πρωτογεωμετρικής κεραμικής στη Μακεδονία.” AEMT 16, 2002 (2004):35–46. Jung, R. 2005. “Aspekte des mykenischen Handels und Produktenaustauschs.” In Interpretationsraum Bronzezeit. Bernhard Hänsel von seinen Schülern gewidmet, edited by B. Horejs, R. Jung, E. Kaiser and B. Teržan, 45–70. Universitätsforschungen zur Prähistorischen Archäologie 121. Bonn. Jung, R. 2006. Χρονολογία comparata. Vergleichende Chronologie von Südgriechenland und Süditalien von ca. 1700/1600 bis 1000 v. u. Z. Veröffentlichungen der Mykenischen Kommission 26. Vienna. Jung, R. in press. “Der Charakter der Nordkontakte der minoischen und mykenischen Zivilisation – um 1600 v.u.Z.” In Begleitband zur Tagung „Der Griff nach den Sternen“, Halle, Landesmuseum für Vorgeschichte, 16.–21.2.2005, edited by H. Meller. Karliambas, G., Besios, M., and S. Triantafyllou. 2004. “Νεκροταφεία της Πρώιμης Εποχής του Σιδήρου στη Βόρεια Πιερία.” In Το Αιγαίο στην Πρώιμη Εποχή του Σιδήρου. Πρακτικά του Διεθνούς Συμποσίου, Ρόδος, 1–4 Νοεμβρίου 2002, edited by N. Ch. Stampolidis and A. Giannikouri, 341–352. Athens. Kilian, K. 1988. “Ausgrabungen in Tiryns 1982/83. Bericht zu den Grabungen.” AA:105–151. Koukouli-Chrysanthaki, Ch. 1992. Πρωτοϊστορική Θάσος. Τα νεκροταφεία του οικισμού Καστρί. Δημοσιεύματα του Αρχαιολογικού Δελτίου 45. Athens. Koukouli-Chrysanthaki, Ch. 1993. “Η Πρώιμη Εποχή του Σιδήρου στην Ανατολική Μακεδονία.” In Aρχαία Μακεδονία V. Ανακοινώσεις κατά το πέμπτο διεθνές συμπόσιο, Θεσσαλονίκη, 10–15 Οκτωβρίου 1989, 679–735. Salonica. Krachtopoulou, A., and K. Touloumis 1993. “Ανασκαφή Τούμπας 1990. Οι εργασίες στην κορυφή της Τούμπας.” AEMT 4, 1990 (1993):289–297. Lambrothanassi-Korantzi, E., Papagianni, E., and Ch. Poloukidou 2004. “Ν. Ευκαρπία Θεσσαλονίκης: Το νεκροταφείο της εποχής του σιδήρου.” AEMT 16, 2002 (2004):249–256. Lemos, I.S. 2002. The Protogeometric Aegean. The Archaeology of the Late Eleventh and Tenth Centuries BC. Oxford Monographs on Classical Archaeology. Oxford. Lioutas, A., and E. Gioura 1999. “Τοπογραφικές αναζητήσεις ΒΔ της αρχαίας Θεσσαλονίκης με αφορμή τις ανασκαφές σε νεκροπόλεις στους δήμους Σταυρούπολης και Πολίχνης.” AEMT 11, 1997 (1999):317–326. Misaïlidou-Despotidou, V. 2000. “Νέα Φιλαδέλφεια. Ανασκαφική έρευνα στην «Τράπεζα» και στο νεκροταφείο της εποχής σιδήρου.” AEMT 12, 1998 (2000):259–268. Mountjoy, P.A. 1999. Regional Mycenaean Decorated Pottery. Rahden/Westf. Papadopoulos, J.K. 2005. The Early Iron Age Cemetery at Torone. Monumenta Archaeologica 24. Los Angeles. Papazovska, A. 2005. “Слоеви од железното време на Вардарски Рид / Iron Age Layers on Vardarski Rid.” In Вардарски Рид / Vardarski Rid I, edited by D. Mitrevski, 115–157. Skopje. Pavúk, P. 2002. “Troia VI and VIIa. The Blegen Pottery Shapes: Towards a Typology.” Studia Troica 12:35–71. Podzuweit, Ch. 1992/in press. Studien zur spätmykenischen Keramik. Tiryns XIV. Popham, M., Schofield, E. and S. Sherratt. 2006. “The Pottery.” In Lefkandi IV. The Bronze Age. The Late Helladic IIIC Settlement at Xeropolis, edited by D. Evely, 137–231. The British School at Athens, Supplementary Volume no. 39. Oxford and Northampton. Rhomiopoulou, K., and I. Kilian-Dirlmeier. 1989. “Neue Funde aus der eisenzeitlichen Hügelnekropole von Vergina, Griechisch Makedonien.” PZ 64:86–145. Sakellariou, A. 1967. “Νέα Αγχίαλος.” ArchDelt 20B'2, 1965 (1967):421. Savvopoulou, Th. 1988. “Ένα νεκροταφείο Πρώιμης Εποχής Σιδήρου στο Παλιό Γυναικόκαστρο του Κιλκίς.” AEMT 1, 1987 (1988):305–311. Savvopoulou, Th. 2001. “Παλιό Γυναικόκαστρο. Το νεκροταφείο των «περιβόλων».” In Πρακτικά του Συμποσίου «Καύσεις στην Εποχή του Χαλκού και την Πρώιμη Εποχή του Σιδήρου», Ρόδος, 29 Απριλίου – 2 Μαΐου 1999, edited by N. Ch. Stampolidis, 169–185. Athens. Schmidt, H. 1905. “3. Die Keramik der makedonischen Tumuli.” ZfE 37:91–113. Skarlatidou, E., and E. Konstantinidou 2005. “Δοκιμαστική ανασκαφική έρευνα στην τράπεζα Γκόνα Θεσσαλονίκης. Πρώτη παρουσιάση.” AEMT 17, 2003 (2005):213–226. Soueref, K. 2001. “Τούμπα Θεσσαλονίκης 1999. Ανασκάπτοντας στην τράπεζα και στο αρχαίο νεκροταφείο”. AEMT 13, 1999 (2001):177–190. Tiverios, M., and St. Gimatzidis 2004. “Ανασκαφικές έρευνες στη Διπλή Τράπεζα της Αγχιάλου κατά το 2002.” AEMT 16, 2002 (2004):223–232. Tsougaris, H.G. 1999: “Ανασκαφικές έρευνες στον νομό Καστοριάς, το 1997.” AEMT 11, 1997 (1999):19–30. Videski, Z. 2007. “Mycenaean Influence in the FYRO Macedonia Identified in the Late Bronze Age Cemeteries.” In Between the Aegean and Baltic Seas. Prehistory Across Borders. Proceedings of the International Conference Bronze and Early Iron Age Interconnections and Contemporary Developments between the Aegean and the Regions of the Balkan Peninsula, Central and Northern Europe, University of Zagreb, 11–14 April 2005, edited by I. Galanaki, H. Tomas and R. Laffineur, 211–214. Aegaeum 27. Eupen. Wardle, K.A. 1980. “Excavations at Assiros, 1975–9. A Settlement Site in Central Macedonia and its Significance for the Prehistory of South-East Europe.” BSA 75:229–267. Wardle, K. A. 1997. “Change or Continuity: Assiros Toumba at the Transition from Bronze to Iron Age.” AEMT 10A, 1996 (1997):443–460. 1 For editorial reasons, topographical names are spelled here in the manner used in the AJA editions or in other recent literature in English. This spelling is not always in accordance with modern Greek pronunciation (for example, today Chauchitsa is pronounced Tsauzítsa or Tsausítsa). The Greek spelling can be found in the list of Fig. 2. 2 For more detailed fabric descriptions of the Central Macedonian Grey Ware see Jung 2002, 47, 198, 446–51 cat. nos. 530–51. 3 A 345/13 (Level 1+0, no closed context) – the rim of a closed vessel, in any case an atypical shape in Central Macedonian terms. It is therefore not clear, whether this vessel is part of the Central Macedonian tradition. It has not been charted here. 4 Personal communication by Jill Carington Smith, for which I am very grateful. 5 Koukouli-Chrysanthaki 1993, 684 n. 22, 701 drawing 6, upper right. 6 See e. g. a cup from Néo Monastíri (Dakoronia 1994, 234, 236 fig. 7, left) and a trefoil-mouthed jug from Pherai (Apostolopoulou-Kakavoyanni 1992, 316, pl. 73γ). These vessels do not have exact morphological parallels in Central Macedonia. However, they can be classed as Grey Ware and must be differentiated from the so-called Black Slip Ware of EAI Euboea, which is also attested in Thessaly (Desborough 1980, 346–7; Catling in: Catling and Lemos 1990, 53–6; Lemos 2002, 83–4). Black Slip Ware, which was in use from MPG until SPG I at Lefkandí, is painted and shows incised wavy lines, while the unpainted Grey Ware has horizontal grooved decoration. 7 However, these would have come from neighbouring inner Balkan regions, not from Bohemia as Heurtley thought. 8 The fragment comes from a context that contained a small amount of material from Level 12 (Jung 2002, 446 cat. no. 530), but comparative material from Toúmba Thessaloníkis can be taken in support of such an early date for the first Grey Ware vessel of the tell on the left bank of the Axios (see below). 9 Andreou and Jung, in preparation. 10 Wardle 1980, 260 with fig. 19.54; idem 1997, 449. 11 Heurtley 1939, 107, 216 fig. 87g. This is the same illustration as Heurtley and Hutchinson 1925–26, 24 fig. 12g. According to the stratigraphic assignment given in that last figure, the piece (probably an example of our carinated cup type 1, see below) was found in sector VIII, second half-metre, upper part. A comparison with the schematic stratigraphy (Heurtley and Hutchinson 1925–26, 9 fig. 7) does not really allow verification of the stratigraphic interpretation given in the later monograph by the excavator. One must simply believe it. Another rim fragment from the lower part of the “burnt layer” most probably belongs to a carinated cup of type 1. It is described as being wheel-made and having a ridge below the rim (Heurtley and Hutchinson 1925–26, 23 pl. 17a.17). Perhaps it is made in Grey Ware. 12 Similarities in the hand-made repertories from both sites show only that both settlements had contacts with southeastern Balkan regions. In PG pottery production there are similarities, too (cf. Jung 2002, 177–79, 190). Again they show that Troia and the lower Axios Valley took part in a wider communication network – in this case encompassing the northern Aegean regions and central Greece. None of the Kastanás vessels is suspected of being an import from the Troad. 13 Cf. Podzuweit 1992/in press, pl. 60.4, 61.4; Mountjoy 1999, 231 fig. 74.183, 184; Popham, Schofield and Sherratt 2006, 183 fig. 2.16.9. 14 Cf. Podzuweit 1992/in press, pl. 60.13, 17. 15 A more detailed discussion of LBA carinated cup types can be found in Jung 2002, 200–7. 16 The single fragment from Level 11 at Kastanás can be excluded as a possible later intrusion (Jung 2002, 201, pl. 66.539). 17 In the preliminary publication it is not specifically listed as Grey Ware, but the photograph clearly shows the broader wheel-marks on the inner rim. At Palió Gynaikókastro one wheel-made Grey Ware deep bowl has grooves on its upper part. – I wish to thank Thomi Savvopoulou for the possibility to see this material. 18 Other examples are indeterminable wall sherds (Jung 2002, 450 cat. nos. 547 and 548, pl. 68.547, 548 – the plate quotations on p. 557 for the indeterminable wall sherds have to be corrected). 19 It may not be without significance, that painted Mycenaean carinated cups and carinated kraters in the LH IIIC Middle and Late Levels of the settlement at Lefkandí-Xerópolis on Euboea were provided with grooves on their bodies – shapes which do not show such plastic decoration in other Greek landscapes (Popham, Schofield and Sherratt 2006, 183–4 fig. 2.16.11, 12, 192–4 fig. 2.23.4 and 2.24.1–2, pl. 46.2, 5 left). At Prehistoric Olynthus (Toúmba of Áyios Mámas) there are several good parallels for the carinated and grooved kraters from Lefkandí. However, at Lefkandí wheel-made Grey Ware was not in use, while it seems to have been the exception at the tell settlement of Prehistoric Olynthus. 20 I thank Joseph Maran for the possibility to examine the material. 21 The most complete treatments can be found in Adrymi-Sismani 2006a, eadem 2006b. 22 Vassiliki Adrymi-Sismani kindly allowed me to examine the material, for which I would like to thank her. The Dimíni Grey Ware is so fine that even mica cannot be seen macroscopically. 23 Cf. however a Handmade Burnished bowl of Italian Final Bronze Age type from one of the houses in the settlement of Dimíni (Adrymi-Sismani 2006b, 36 fig. 22,BE 2969), which based upon Italian parallels was produced later than LH IIIC Early (Jung 2006, 36, 216 fig. 24). I thank V. Adrymi-Sismani for information on the find spot of this vessel. 24 Furthermore, the date of EIA Grey Ware vessels found in Thessaly must be better defined. Jung, R. "On the origin of the wheel-made Grey Ware found in Central Macedonia." 10 Jun. 2007. In: Horejs, B. - Pavúk, P. (eds. ): Aegean and Balkan Prehistory. http://www.aegeobalkanprehistory.net/index.php?p=article&id_art=4 (23 Apr. 2019).